And that’s not all. When it comes to assessing our capability to deploy troops, Australia has only the capacity to operate on a rule of three. It’s called mathematactics. That is, divide whatever our military strengths are by three, because while one third of our army, navy or air-force is on operations, one third is in for maintenance or repair, and the other third is working up the skills and procedures necessary to head out on operations next. It’s obvious, when you think about it: maintaining a unit in the field soon exhausts people and equipment. So plans to deploy a whole battalion or 200 of our special forces to anywhere for any purpose leaves Australia vulnerable if things go wrong elsewhere. It is tempting to dismiss Abbott’s grandiose proposal as just another example of the embarrassing folly of the man who knighted Prince Phillip, but it’s more serious than that. 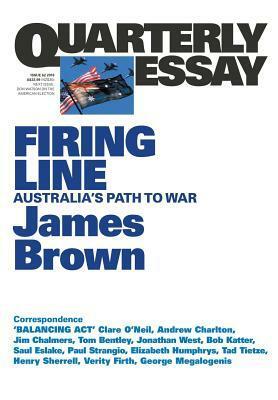 James Brown, now research director and adjunct associate professor at the US Studies Centre at the University of Sydney, uses it as an example of how we in Australia don’t have satisfactory processes for determining when, how or why we should go to war, nor how to analyse whether the success of our military objectives, if there were any clear ones to start with, can be evaluated. If Abbott had not been dissuaded, he could have made this colossal blunder as easily as John Howard committed Australia to deployment in Iraq. Like most Australians, I am not interested in military matters, but if pressed, I would admit that I expect my government to keep me safe from external threats. To have an adequate military force, and to have proper processes for determining when and how and why it gets used. Although I’ve been opposed to nearly all wars since WW2, I’m not a pacifist, and I think some wars can be justified if they pass the Principles of a Just War. I expect my government also to have smart people predicting potential scenarios, and analysing past deployments. I was pleased to see that a book Two Futures (see my review) written by my local member Clare O’Neil and fellow MP Tim Watts gets a mention as being on top of defence issues, but it’s important to get this conversation going. If your eyes didn’t glaze over at the title of this post, and you’re still with me, get a copy of this Quarterly Essay or nag your library into getting one, and then read it. You can also read an excerpt at the QE website. Update: 26/8/16 A bunch of parliamentarians and former military chiefs are demanding action on the PM’s power to take us to war! See the ABC report here. Source: my subscription to Quarterly Essay. My answer to the first two questions was yes and yes. But for the last one, can’t I just read your review? Come on, it’s only 60-odd pages. You could read it over lunch. (But you raise an interesting point: I sometimes read reviews of NF books and think, well, I don’t need to read the book now). That issue of accountability is (or should be) is current in the wake of the review in the UK, over and done with here with a two-minute interview with John Howard and that was the end of that. As for Trump, the Pauline Hanson of world politics? I keep reminding myself that we survived a president who used astrology in decision-making… but I don’t find it very comforting. LOL I hope you like my next two books: I’m reading Denny Day, the lawman who brought the Myall Creek murderers to justice, and Their Brilliant Careers which is a spoof of the Australian literary landscape. That plan by the PM smacks of a politician trying to make the grand gesture to puff up their importance on the world stage. We have even more worrying examples in the form of Donald Trump. Fortunately wiser heads prevailed this time but you raise a key point about how decisions will be made in the future. Australia’s geographic location make its role in potential future conflict in the south China seas pivotal. Hope someone in yiur government is working on this. But this whole topic has made me wonder about processes for deciding to go to war worldwide. Brown makes the point that a decision like that is the most significant decision any leader can make, yet it’s not just in recent times that decisions have been made in a cavalier way. And not having clear objectives, not having thought things through is why WW1 was such a debacle. What, I wonder, was Plan B in the Bay of Pigs crisis? In my naïveté I had thought that in the nuclear age that there would be a well-thought out process for all kinds of contingencies, but that’s not the case at all. That book, Five Days in London, by John Lukacs (https://anzlitlovers.com/2009/04/13/five-days-in-london-by-john-lukacs/) is also an interesting one from the other angle, analysing the WW2 situation, which most people agree was a just war that had to be fought.